Stargroth Amean will captain a 22 SP PNG Hunters team in thier only trial match against the Brisbane Broncos on Saturday at the Oil search National Football Stadium. Hunters coach Michal Marum at training Tuesday clearly pointed out that it was a tough match with the players to give their best. “We are defending the Intrust Super Cup, there is a lot of talk of PNG being considered in the NRL competition and probably we can show everyone else probably if we can match the Broncos play well against them and along the line maybe few years time we can do that. “Probably a bit more pressure on the boy’s expectations on everyone else and we want to see the boys to go out play and win as well. “We don’t want to really look at the result we expect our players to give 100 per cent, they are after fighting for spots in the round one match as well. “It will be tough, the Broncos have had two trial matches so far and a good win against the Titans in their second trial over the weekend,” Marum said. It’s going to be a lot tougher with captain Ase Boas sitting on the sideline, and a few key players still with niggling injuries. But Marum says they will not be forced to play, with enough players in the team to fill the spots come Saturday. “We got a few niggling injuries with Willie Minoga, a groin, Wartovo with the same ankle injury from last year, few other boys, Moses Meninga and Enock Maki, we have given them till Friday but we are not in a rush to get them in. “We got a couple of good boys, Mekenzie Yei is a big boy only 20 years old from Hagen, Aba Baundo from the Mioks team and a few other young boys as well, until you see them play a few games together, they have been training well and they have earned their spots in the team,” Marum said. He added that with Ase nursing injury to his thumb, Charlie Simon will replace him at five eighth. “Charlie Simon, former Snax Tigers, will be given the number six jersey and also the kicking duties, it’s a bit more responsibility. 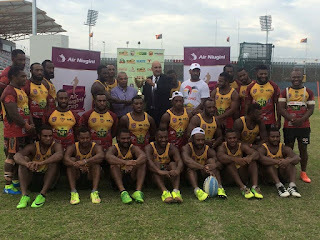 Ase wants to play but no rush, it’s a trail match and will be an honor for the boys with some of the players favorite players in that side, but they know they are going out there vying for spots in the start of the season,” Marum said. Asked how he felt given the responsibility to lead the team, Amean said he is humble to take up the role of captain Ase Boas and it all comes with big responsibility to lead the team. “It is a big shoe to fill and come game day I will try to do what I can do to lead the boys and direct them around the park,” said Amean. The Hunters team has been in good training shape and Amean said at the moment in camp all the players are trying to keep calm, relaxed and composed and not thinking too much about the game. “Every game for us is a big game and a new game so we are feeling relaxed at the moment and concentrating on training sessions,” said Amean. “We are taking one training sessions at a time and the game will take care of itself.” Amean supports the Brisbane Broncos as his NRL favorite team and he said he will take this game the same like any other and give his best. “I never thought I will play a team like Broncos, I’ve been playing only at QRL and every opportunity is a dream come true for me and I’ll grab it with both hands and make good use of it,” said Amean. He said he really looks forward to the game and is looking forward to the team.